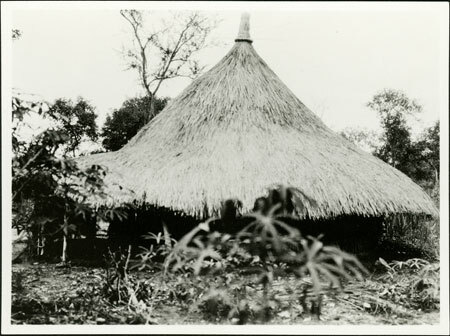 A hut, showing the extended eaves of the roof supported by an outer ring of roof supports, creating a shaded area around the clay-walled hut within. The finial has a woven loop with at least four thin sticks extending outwards, probably against witches. Morton, Chris. "Zande hut" Southern Sudan Project (in development). 03 Jan. 2006. Pitt Rivers Museum. <http://southernsudan.prm.ox.ac.uk/details/1998.341.69.2/>.